Posted by Unknown / On : 10:18 AM/ Thank you for visiting my small blog here. If you wanted to discuss or have the question around this article, please contact me e-mail at Gps_86@gmail.com. To appropriate component. So we can’t charge mobile or we get charger trouble that battery shows charge indication but doesn’t store charge so it discharges immediately. 2. Check that the first pin point is connected to ground earth as shown in the red line. 3. Check that the second point is connected to the upper point of the charging transistor as shown in the blue line. 4. Check that the third point is connected to the vcc point on the PCB as shown in the green line. 5. Check that the fourth point is connected to the VBat point on the PCB as shown in the yellow track. 6. Finally check that the last point is connected to the positive on the PCB as shown in the pink line. 7. After checking all the points, if the voltage is missing on any point track, then apply the jumper as shown in the above image. While checking all the lines we should properly check all charging points carefully because wrong or bad soldering may damage the charge circuit. Soldering is more than just melting two points together. 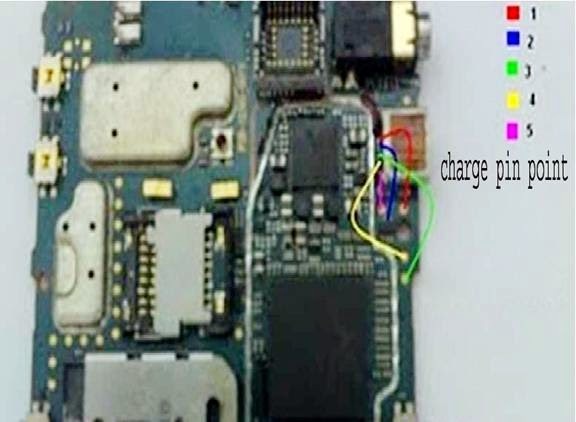 It has to be done a certain way so as not to interfere with the operation of the charger or even cause some serious harm to the charge circuit.